For Ever: Creative Business Thank You Cards to Wow Your Clients! Get creative with a memorable way to thank your clients for their support of your business with our plantable thank you cards! These are business thank you notes they won't forget. With wildflower or garden herb seeds in the paper, your recipients can plant them and remember your business all summer long! They are sure to spread the word to their friends and family, and hopefully expand your client base and ultimately bring you more business. 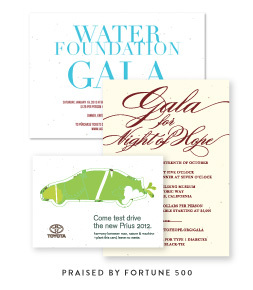 Green Business Print has plenty of designs to choose from and they are fully customizable. You can even add your company logo. Better yet, you can upload your custom artwork and create a truly unique thank you card. 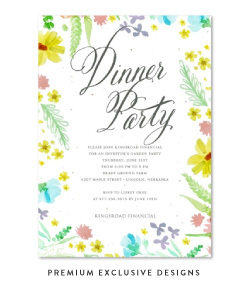 While the plantable paper is sure to impress, if you need to stay under budget, we also offer our printing services on our 100% recycled paper. If you have a great logo, or even a talented designer that can create awesome artwork, submit your artwork and text today to get a digital proof via email, within 48 business hours! Keep it classy San Diego! Ron Burgudy said it best but you can keep it classy no matter what city your business is headquartered in. A simple way to thank your customers is with our Classic Stripes thank you cards. Submit your logo and we will add it to the back of the card. Choose your custom colors and create the perfect thank you note for your business! Does your business involve animals? Or maybe you are just an animal lover! 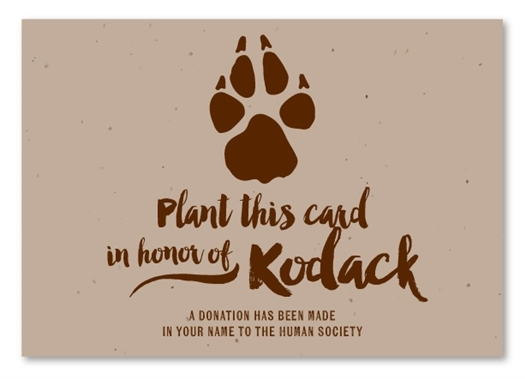 The Paw Print thank you notes are an adorable way to thank your clients. 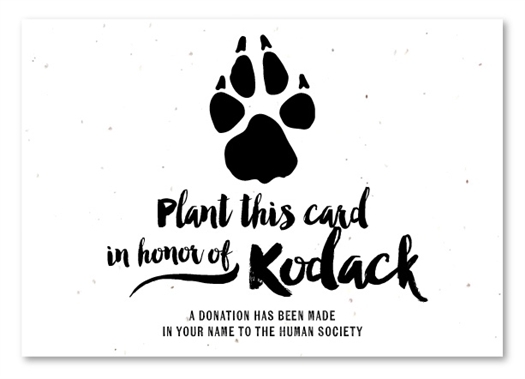 Perfect for an Animal Shelter or any animal conservation fundraiser. When you can't be there in person to shake your customer's hand, have then shake your paw with these creative business thank you cards. Our Desert Brown plantable paper is embedded with garden herb seeds - oregano, basil, chives and thyme. Give back to the earth, plant the cards, and watch your garden grow! Diversification is key! 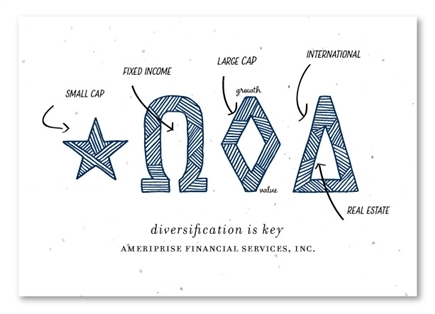 Any financial company knows this and we've illustrated this point with these creative business thank you cards. 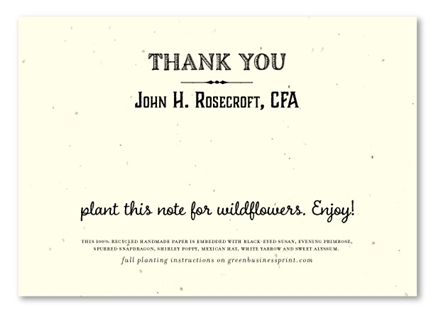 Make sure your clients don't forget this rule by sending them unique thank you notes they can plant! They will start to diversify their garden with herbs or wildflowers. Popping champagne is one way to make bubbles, sending out these cute thank you notes is another! With a bunch of adorable sayings, and smiley faces, they are sure to put a smile on your recipient's face. Many thanks, you made our day, thank you so much - these are some of the bubbles we've created but like all of our thank you cards, they are customizable with your own text. We can include any text you want! Tell your customers to water these thank you notes after they plant them to create a beautiful garden of wildflowers or garden herbs. We are fond of the phrase, "Thank you for helping our business grow" but you can customize all of our thank you cards to say whatever you wish. The watering can is pouring out words of gratitude and appreciation, to let your customers know how important they are to you and your business. Simply and creative, these thank you notes are sure to please! Shop all of our Creative Business Thank You Cards now! 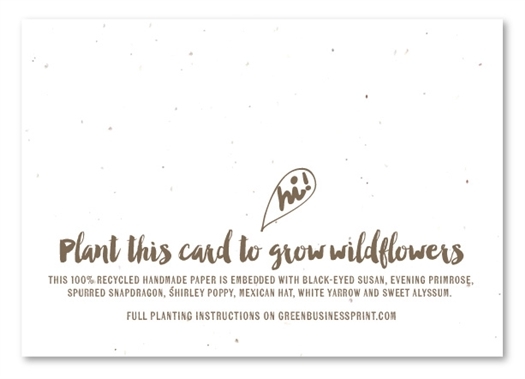 Where to Buy Plantable Paper!